More than 120 firearms officers in London are refusing to carry guns after two colleagues were suspended over a shooting, police representatives claim. 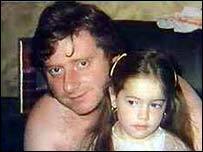 Harry Stanley, 46, was shot dead in 1999 after police mistook a table leg he was carrying for a shotgun. An inquest on Friday returned a verdict of unlawful killing and Pc Kevin Fagan and Insp Neil Sharman were suspended. 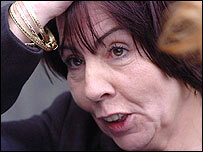 Mr Stanley's widow, Irene, says other officers should go back to work as the verdict "has nothing to do" with them. She told BBC News: "They weren't there. It was to do with the two officers who got off with the killing." Sir John Stevens, the Metropolitan Police Commissioner, has taken personal control of negotiations in the dispute. He said he had great "sympathy" for the protesting officers, but "they must come back to work". On Monday, at least 20 of the Met's 400-strong SO19 specialist firearms unit handed in their cards authorising them to carry weapons. 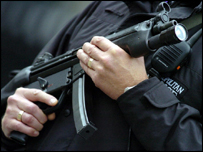 The Metropolitan Police Federation (MPF), which represents officers, said that by Tuesday over 120 firearms officers had handed back their authorisation to carry weapons. The body also said there were no specialist firearms officers on duty in London on Tuesday. Scotland Yard would not confirm the numbers involved in the protest but said the level of armed cover in London was "unaffected". After the inquest - the second into Mr Stanley's death - the Crown Prosecution Service, which had previously ruled out bringing charges, said it would review the case. Glen Smyth, chairman of the MPF, said the case had thrown into doubt all training and guidance given to firearms officers. He told the BBC Radio 4's Today programme: "The officers are very concerned that the tactics they are trained in, as a consequence of the verdict, are now in doubt. "They want some clarity around what they are expected to do." The Stanley family's solicitor Daniel Machover told Today the jury "did not believe the officers when they said they felt under imminent threat". And he later accused the protesting officers of "misunderstanding what the inquest was about". He said the jury's decision was not a "broad attack" on the tactics of firearms police, just that they did not accept that the two officers had acted in self-defence. How can the level of armed cover remain unaffected if the police hand in their weapons? Mr Smyth said he would consider mounting a legal challenge to the inquest's verdict. Jan Berry, chairman of the Police Federation of England and Wales, said she was not surprised by the officers' reaction. She said: "With the benefit of hindsight we can all say what we may have done but these two officers were required to make a split-second assessment and decision." Mr Stanley, a father-of-three, was shot as he left a pub in Hackney, east London, carrying a table leg which had just been repaired by his brother. The two officers fired the shots after mistakenly being informed that Mr Stanley - a Scottish painter and decorator who lived in London - was an Irishman with a sawn-off shotgun. The Stanley family, originally from Lanarkshire, won a ruling in the High Court in April this year to have an open verdict from his first inquest quashed. In a statement on Friday the Met said the death of Mr Stanley was regrettable and offered sympathy to his family. Were police right to refuse to carry guns?